On StrongVPN‘s official website home page, they claim to offer military internet security. They also claim to have positive reviews from more than 5,000 satisfied customers. However, to know the security and strength of a VPN service, the best way is to try it out. That is why we decided to write this StrongVPN review after trying it out. The first thing that we uncovered bout the StrongVPN company is that it is a sister company to Reliable Hosting, a dedicated web hosting provider that has been in the market a long time. This tells you that you will experience no problems at all with server switching, performance and reliability. We also discovered that this company has many servers, more than 500 in more than 22 countries in different parts of the world. Out of these servers, about 368 are OpenVPN servers that are located in 44 cities while 238 PPTP servers are located in 43 cities. StrongVPN price and free trial Firstly, StrongVPN offers a 7-day money back guarantee. This is a bit on the lower side, but hey, reasonably, five days should be just enough for you to decide whether the VPN service is going to serve your anonymity, privacy and security needs when you are on the internet. Apart from the money back guarantee, the prices are a bit on the high side. For example, their primary product running on the PPTP protocol is sold at $7 per month. You should however, note that the PPTP protocol is not the most secure VPN and if it’s sold at this price, then we can conclude that this is a very expensive VPN service. In addition, one thing that you should know is that there is no standard pricing with this VPN. What happens is that when you pay for a certain package, there are some features that you can or cannot access. For example, if you pay for the $7 a month Lite package, you will access the VPN network through the PTPP protocol. If you pay for the $12 a month Standard package, you will access the VPN service through the OpenVPN protocol. Remember, for these packages, you only get to use the servers in the US. And then there are the two Deluxe packages. One costs $15 per month and with that, you only get to use the PTPP protocol. The other Deluxe package costs $20 a month and you get to use OpenVPN protocol. For these packages, you get to use servers in 19 countries. The last one is the Premium package, which will cost you $30 and then you get to access VPN through the PTPP and OpenVPN protocols. From $7 to $30 a month, well, you can see that this is an expensive VPN service. StrongVPN speed The speeds are commendable, higher than most providers in the market. 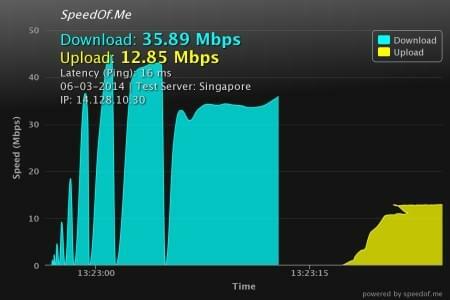 For example, on average, the upload speed is 15Mbps, the download speed is 18Mbps and ping time is 51 ms. These are just the average speeds, so the number could rise or fall. The most important thing is to find the fastest servers. For example, the servers in the Netherlands could give a slower performance, but that is negligible. To get the server that will serve you best, you can use the speed test page on their website to test the servers. This will save you a lot of trouble. YouTube, streaming and downloading stuff was effortless. P2P services worked just fine. Generally, the speeds are high. In addition, many questions regarding speed and performance have already been answered on their FAQ page. This company is based in the United States of America. Why did we mention this? In the USA, a VPN company can be subpoenaed so that it produces the users’ details when needed by the law. Therefore, many users of VPN prefer to use VPN services in other countries if they are from the US. Does this mean they keep logs? Maybe, but many VPN companies do keep logs. What matters is the duration of time that they keep the logs. Some reviews on the internet say that StrongVPN will change your IP address to another, but a static one. Many experienced VPN users want dynamic IP addresses. However, the saving grace is that they do not store any data regarding the users’ activities, or the sites that one has visited or stuff that he/she has downloaded. This way, they cannot produce data that they do not have even when subpoenaed. To understand StrongVPN security, you have to know the kind of encryption technology that they use. StrongVPN security uses 2048-bit for key exchange and 2048-bit RSA certificate to verify that the key came from a secure server. All the data exchanged through this VPN network is encrypted using the 128-bit key and the AES-128-CBC cipher. At the same time, HMAC authentication is also enabled. Using the MOBIKE protocol, reconnecting to the VPN when connection is lost is easy. At the same time, note that for the basic packages, you will only be able to use the PTPP protocol which offers just basic security. For the other higher packages, you can use both PTPP and OpenVPN protocols. IKEv2 protocol is used for the iOS devices and it is as good as the OpenVPN security-wise. The technical team offers support 24/7 through email and live chat. However, even before you get there, you will find that most of your questions have been anticipated and answered in the FAQ page. However, you can always chat with a real person should any issue ever crop up. While the speed and performance is good, any fair StrongVPN review will tell you that this is not a poor man’s VPN service. It is costly. However, if all you need is basic security such as that offered by the PTPP protocol, then this is your ideal VPN. However, to help you make up your mind, just select the package that fits your needs best and then sign up for the 7-day test period. If you like it, you can then continue using it and if not, you can just discard it.